Apex Launcher is a powerful, fast, and highly customizable home replacement for Android 4.0+. 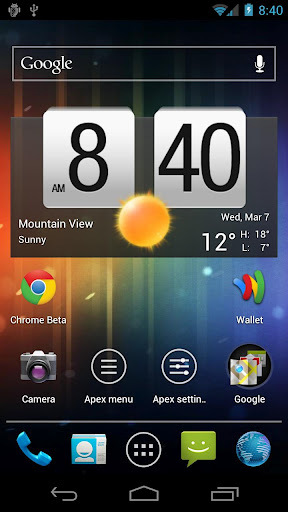 Apex Launcher helps you create a customized homescreen experience on your Ice Cream Sandwich (Android 4.0) device. In the pro version, you can use themes from all of the major launcher apps, giving you a HUGE selection for the look and feel of your device! It’s specifically for ICS devices, so if your manufacturer hasn’t upgraded you (or you didn’t root and upgrade yourself) then this launcher won’t work for you. I’m no stranger to launcher replacements – on my older MyTouch 3G Slide, I’ve used LauncherPro for years. However, when I rooted my Galaxy Tab and got it stable enough on ICS to start playing around with things like launcher replacements, I was pretty excited for this one to come up. I had heard a lot about it, and was looking forward to trying it out. If you want to be able to adjust not just the look and feel of how your device works, but go in and tweak almost everything imaginable, then this is a good launcher for you. Right out of the box, the default settings are great, and work flawlessly. But once you start poking around, you discover how robust the options are for personalizing. And, a bonus to me, is that you can backup not just your settings, but also your desktop placement. So now, when you start messing with things, it’s easy to go back to your default whenever you want. I’m a big believer in backing up my devices regularly, so this was a really nice perk. In the paid, pro version, you get a lot of extras, but probably the greatest is that it offers theme support for all of the other major launchers out there. So all those Go EX or ADW themes you see in the market – you can run them too. It means that there are literally hundreds of options to choose from, all the way from a basic wallpaper to a complete look and feel overhaul with a few button presses. And there is a good selection of both free and paid themes, so you’ll be able to find exactly what you’re looking for, whatever mood you happen to be in at the time. I really liked how easy and seamless the folders are in Apex as well. In the default launcher I was coming from, I used several homescreen to differentiate between what I was doing, because I couldn’t get it all on one page. I like that, with folders, I can keep things a lot more organized. I know that’s not exclusive to Apex, but it works seamlessly and easily in this launcher. In terms of performance, it just works. I did have one little hiccup where I had to go into settings and restart Apex because I just had blank homescreens, but to be honest, I’m fairly certain it was operator error more than anything else. It only happened once, and I couldn’t replicate the problem, so I mention it, but I’m not positively certain it was the launcher itself. If I had to list a negative, it’s that this is ICS-only. If you’re on an older device that hasn’t been upgraded, or you haven’t rooted your device to move to a ROM that’s ICS-based to upgrade yourself, you won’t be able to run this launcher. Granted, there are a lot of ICS devices out there, and more on the way, and by not focusing on backward support, the developer has given a tight, well-done product that works with all of the new features and tweaks ICS brought. But for anyone who doesn’t have or can’t get ICS on their device, it’s a let down to not be able to use this launcher. The key feature is that it allows you to break free from the herd and personalize your phone or tablet to your tastes, either by predefined themes or those you can tweak yourself. Like any good launcher, once you set it up how you want it, it fades into the background and just works. The ability to really tweak it to get it exactly how you want it, along with the tight ICS integration and speedy responsiveness make it a great launcher to use on a daily basis. The settings on installation are good, but to really get the most out of this launcher, you’ll want to go in and tweak it to your own personal preferences. When you first start, there are a lot of settings, and it can be a bit overwhelming, but once you dive in, you’ll find it’s quick to go through them and see what they do. Again, a launcher is something you use constantly. It’s your default when you aren’t in another app, and it can effect how you feel about your device, since it can either speed the whole thing up, or it can drag you down and make you feel like you’re always sitting around waiting for it to load. This one falls in the first category, making everything feel quick and snappy, and a pleasure to use. Should you Download Apex Launcher? If you have an ICS device, then this is a launcher you really want to check out. I fell in love with it quickly, and it’s just a great launcher with the right balance of options and speed.